PHUKET: Austin was a great race for McLaren. Lewis Hamilton, on the dirty side, lost ground on the first corner, but after four laps passed Mark Webber. Then he hunted down Sebastian Vettel and when Narain Karthikeyan momentarily slowed Vettel, swooped into the lead on lap 42. Jenson Button started on the dirty side, dropped to 15th and fought back to fifth by the end. McLaren is now only 14 points behind Ferrari for runner-up in the constructors’ stakes. It was a great race for Ferrari, who deliberately broke a seal on Felipe Massa’s gearbox to get a five-place grid penalty and promote Fernando Alonso to the clean side of the grid. Alonso went from seventh to fourth on the first corner, and moved up to third after Webber’s demise with alternator problems. Massa fought brilliantly to finish fourth. It was an OK race for Red Bull. 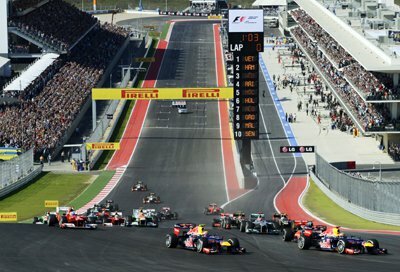 Vettel’s gameplan was interrupted by Hamilton, but he increased his lead to 13 points, and Red Bull won its third consecutive constructors’ championship. So it’s on to Interlagos, located in São Paulo between two lakes, in the slums of Cidade Dutra. The track was inaugurated in May 1940. The first real F1 Brazilian GP was held at Interlagos in 1973. When I first went to Manila in the early seventies, maps were useless, because official street names reflected transient government namings in favor of heroes of the time. People ignored the ephemeral foibles of politics, and stuck to old names. To get to Roxas Blvd, a taxi driver needed to be told to go to Dewey. It’s like that with Interlagos, renamed Autódromo José Carlos Pace in 1985, after a Brazilian driver who won his only race there in 1975. Deemed unsafe, Interlagos was abandoned by F1 in favor of the Jacarepaguá circuit in Rio de Janeiro in 1978. In 1988 Jacarepaguá was renamed Autódromo Internacional Nelson Piquet, but I have never heard anyone use that name either. F1 returned to a shortened and modified Interlagos in 1990. Brazil is traditionally the season’s final race, which often means that everything is often decided before the circus reaches them. To win this Drivers’ Championship, Vettel realistically just needs to finish. Alonso needs Vettel’s alternator to melt. So I expect Vettel to drive a defensive race. Hamilton will really try to win again, and Button and Kimi Räikkönen are both in contention. The 4.4 kilometer Interlagos circuit is anti-clockwise, hard to drive and demands power from engines. The race is tough on cars, and tough on drivers. Cars need outstanding balance to manage the technical middle sector, and speed for the rest. Weather is always a factor in Interlagos, and rain is quite likely for the race. It starts on the “Tribunas” straight, followed by the “Senna S”. This connects with “Curva do Sol” left-turn that leads to “Reta Oposta”, the track’s longest but not fastest straight. Then a pair of downhill left turns called “Descida do Lago” into a short straight that goes down again. This is followed by a slow and difficult section, with small, kart-like turns and elevation changes. Turn 6 is downhill and “Laranjinha” is a very slow right. Turn 8 leads into “Pinheirinho”. Then “Bico de Pato” is an easy right kink into the near-hairpin that gives it its name, followed by a constant-radius left-hander that slings the driver straight into a harder left at “Junção”. A left uphill kink marks the start of the long, top-speed section. Rising up through “Subida dos Boxes”, the driver encounters a long left turn, which demands a lot of power. At the end of it is the “Tribunas” straight. From the exit of Junção all the way into Senna’s S is one of the longest full-throttle stretches in F1, and demanding on engine’s reliability. Interlagos has one of the longest pit-lanes ever used in Formula One, so pit stops are expensive. Pirelli will again provide the medium and the hard compounds, but this track is more abrasive than Austin. So expect two-stop strategies. The race is on the big screen at the Green Man 11pm on Sunday, with qualifying at 11pm on Saturday. Click here for more information.